Yup, when this posts, I’ll be at the airport awaiting my flight. My plans? See that white island in the bay in the distance? That’s Alcatraz. I’ll be spending most of Thursday there, taking the first ferry over in the morning and going back on the last ferry for the night tour. I’m so excited! As for the rest of my few days there? Chinatown, Fort Point, Baker Beach, California Street … so much ground to cover, but if I can walk 33 miles in 3 days in New York City, I think I’m up for this challenge! This entry was posted in California, Cityscapes, Landscapes, Places and tagged Fuji X100T, landscapes, photography, postaday, San Francisco. Bookmark the permalink. Never been to San Francisco but it’s on my bucket list. Looking forward to your photos! I am going to have to go back to San Francisco just so I can go there. I am so jealous you are going there. I love San Fransisco, and I think you will too. 33 miles with how many pounds of camera gear? wow! Have fun Stacey, looking forward to your images! Watch out for those hills, though! I would suggest North Beach, too. And I could go on and on. I went to SFSU for some of the best times of my life! Feel the burn 🙂 Yup, I’m definitely up for a harder workout that in NYC! Thanks for the suggestion on North Beach. I’ll have to do a bit of googling to figure out where that is! It’s a short walk to the wharf, as I remember. Great outdoor cafes and Italian restaurants. Thanks, Emilio! And can I just says, now that I’ve been wandering the streets of San Francisco, you were SO RIGHT about the hills. Oy vay …. 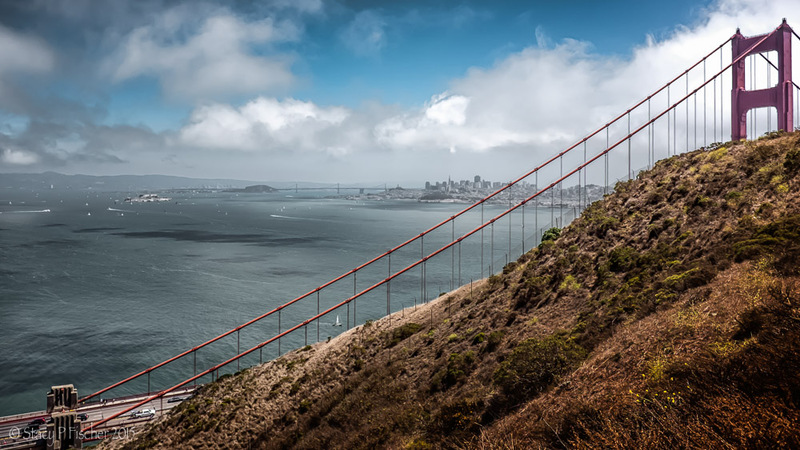 The people who I traveled with out here laughed when i suggested Alcatraz Island…but as soon as we landed, everyone found it to be a fascinating place…enjoy! And they have to make the effort to get there…not just wander in. I so wish I was coming with you, Stacy. San Francisco is one of my favourite cities. Oh, Hugh, I wish you were too 🙂 I’ve missed visiting your blog lately, but I can imagine you’re as busy as ever! So nice to hear from you. I promise to pay you a visit once back from SF!! I’ve only seen it from across the Bay. Have fun Stacy and can’t wait to see your fab views, particularly the night shots from Alcatraz. What a spectacular shot above of the GGB, love the fall of the arch across your frame! Wish I could be there with you as well. . . . hope you get back to NYC soon! I love San Francisco. You are going to have a blast! I love San Francisco – though I’ve not been there for 15 years – and I can well imagine what a treat it will be for you as a photographer. I look forward to reading about what you do and, of course, seeing all of your photographs from the trip. Alcatraz was a highlight of SF for me so I’m sure you are going to love that visit. Thanks, Laura! I’m spending part of my time on the flight mapping out my shooting strategy 🙂 And it looks like the weather is going to cooperate – 70’s and partly cloudy. Woo-hoo! Any chance of getting a pic as viewed from a trolley at the top of the street, lookin’ down….I feel dizzy just thinkin’ about it!! Must have the Bay in the background. Maybe a selfie of you hanging off the trolley…you know?! Enjoy! Yes, I guess you will have to go back, Stacy! That’s an order…lol. 😉 At least, you got some exercise and fantastic views, no doubt. Look forward to seeing what you did manage to capture. Cheers!